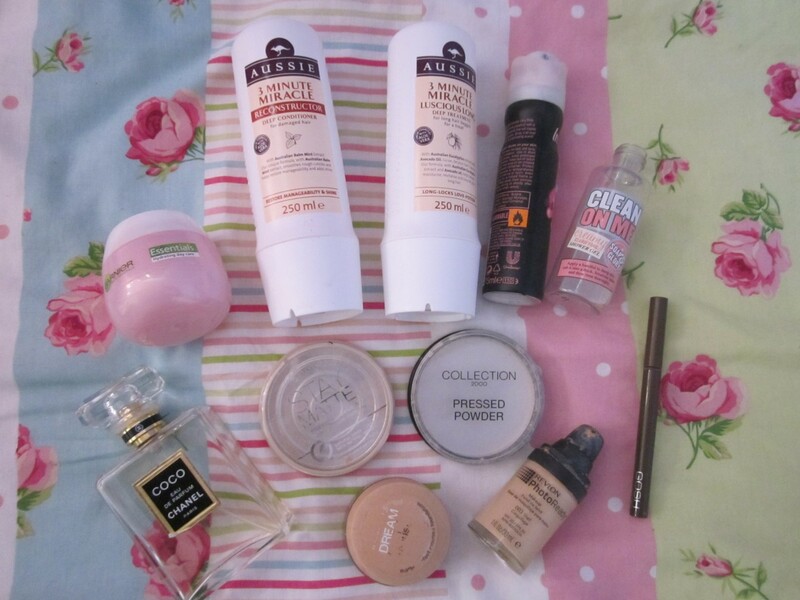 so, today i thought i'd do an empties post seeing as i have accumulated quite a few products. Admittedly, i haven't only just finished these in the month of january, many i finished back in november, but i've been saving them up in a little bag just for this post! I love these 2 conditioners! I usually use them about once a week, and generally leave it on for 5-10 mins for extra moisture! I definitely saw a difference in how smooth and not as damaged by hair was when using this! I got it on offer for 3 for 10 on aussie products in boots, and seeing as they are around 4.99 each anyway, i was basically getting one free! I usually use this after sport in school to freshen up, this isn't really my favourite scent, but it's nice to spritz on after pe! probably not, i have quite a few body sprays i need to use up! this is so nice. the smell is gorgeous, and lasts well on the skin! it lathers up nicely and makes your skin feel so smooth! i got this as a minutare in a gift set and actually lasts quite well considering the amount that is in there! this is a really nice, basic moisturiser, it didn't really have a scent, which is nice and gave my skin the moisture it need to and didn't break me out! No, i have quite a few moisturisers i need to get through. my mum gave me this perfume quite a while ago, and i have only just almost finished it! it lasts for ages! this is such a gorgeous smelling perfume, as are all chanel perfumes. as you may be able to see, it isn't completely empty, but i really don't want to finish this bottle! definitely, although it is on the pricey side. this powder is very popular among bloggers and i can see why! It doesn't look cakey or stick to dry patches! It just mattifies you skin! amazing! collection pressed powder this can make me look a tad washed out and really pale! compared to rimmel stay matte it is close in quality, but i prefer the rimmel one! not when i have my trusty rimmel stay matte by my side! this is a favourite of many people, and it used to be mine a long time ago! before i discovered liquid foundation and how to apply it properly. when i first bought this i really didn't like it, but i revisited it quite recently and fell in love with it! it had a gorgeous dewy finish without making you appear cakey! this eyebrow pen is a bit of an iffy product with me. when you first put it on it looks really nice on your eyebrows, but within a few hours it begins to go green! yes, GREEN! it isn't a good look, believe me. So, they are my january empties for you all! 24 comments on "january empties"
I adore the Rimmel stay matte powder! Don't think i'll use another again! indeed! and i know.. how odd! Your blog has been accepted in Europe United Kingdom n°326 a minute! Follow you back on gfc and bloglovin #8. I could never finish a whole bottle of perfume...that's intense! I love empties posts, this is such a great one, I'm using the new Aussie Shine Mask and really loving it. thank you and ooh might check that out! Nice products!!! thank you so much for your visit! I love Collection 2000 Pressed Powder and in fact mine's just finished too! How weird haha!